Designated as the “Royal Porcelain Manufactory” during the mid-eighteenth century under the reign of Louis XV, the Sèvres Porcelain Manufactory needs little introduction as one of Europe’s most innovative and influential porcelain manufacturers during the eighteenth century. Eight years before Sèvres manufactured this cup and saucer in 1780, Louis XVI had become king, and the manufactory faced a series of creative and financial changes due to the new king’s administration. Coupled with fierce competition from other European ceramic manufacturers and France’s recent discovery of true porcelain’s key ingredient (kaolin, available in the Limoges area), the late eighteenth century was a difficult period for Sèvres. The manufactory’s survival would be further challenged in 1789 with the French Revolution, and afterward would continue through the nineteenth century under the vision of a new director, Alexandre Brongniart. The painted decoration of this cup and saucer—in both color and form—captures the elegant spirit of Sèvres. Its delicate shades of yellow, lavender, and pink are enhanced by the gold decoration, while the assortment of stylized flowers, festoons, and swags have playful exchanges, such as the harmonious contrast between the gold arabesques and the realistically rendered roses. Additionally, the festoons hint at the popularity of neoclassical decoration during the late eighteenth century. Although the cup and saucer’s stylized ornament is not executed in the popular Etruscan style that Sèvres was producing at this time, it marks the transitional period from rococo to neoclassicism in French decorative art. 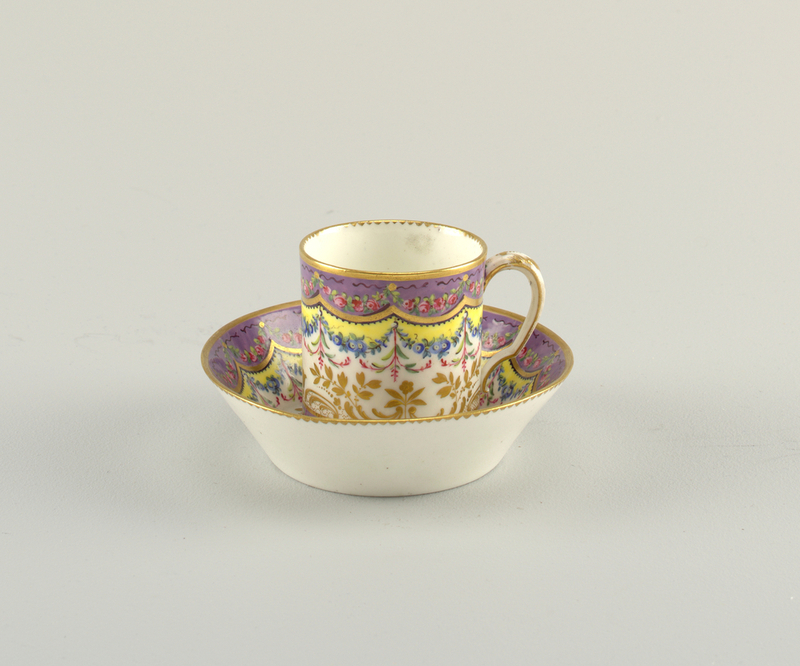 Although this dainty cup and saucer may not represent Sèvres’ more notable wares, they reflect the variety of styles Sèvres was creating during the eighteenth century. Liana Paredes, Sèrves Then and Now: Tradition and Innovation in Porcelain, 1750-2000 (London: Giles, 2009), 11–12. Cup And Saucer (France), made by the Sèvres Porcelain Manufactory, ca. 1780. Glazed porcelain, gilding, enamel decoration. Gift of Mrs. Morris Hawkes. 1942-25-21-a,b.